Here is another installment from the Harrison Herald from Val F., an American that moved to London and wrote back to the fan magazine about the news from London. This is right after she moved to the city in the spring of 1970. This article was published in the September 1970 issue of the newsletter. I moved to London on May 21st with the help of my mum (God bless her!) and Dad's mastercharge. I live in Mayfair, the nicest (or worse, depending...) section of London. I have a job as an Au Pair worker (chambermaid to put it bluntly) which could be worse. If any of you would like info on how to get her and stay here, I'll be happy to send it to you. I could tell you about my adventures at Apple, but George, John, Paul and Ringo fans would be bored to tears. And since this is the George newsletter I'd better keep it so. I was at Apple a few days ago when an Apple employee (who shall remain nameless for his own sake) came out on the steps and smiled saying, "Ah, all the American tourists have gone home!" I innocently said, "Pardon amoi?" Enough. Anyone who says the Beatles are a moody lot, I can vouch for! One minute Ringo is pushing cameras away and the next minute he's busy signing autographs galore. George is friendly most of the time, though on occasions he becomes so fed up he's rude. All of you Captain Hook lovers, Geoge has a lovely pirate flag atop Friar Park. Really cracks me up each time I see it. All those headed for Henley-on-Thames -- beware of the dog! He hasn't bought it yet, but that sign's been up for ages. I believe he's getting a big fierce bulldog. In answer to the comment "I thought he didn't like dogs!" I can honestly say he dislikes snoopy fans even more. In the meantime, while George is dog searching, Terry Doran is doing a superb substitute job. In fact, I'm taking him a collar and chain next trip up. My first trip to Friar Park was a total fiasco. First Terry called us "crap". Then he took my box of "good news" candy for George without a ta or thank you. Then we were taking photos of the convent and grounds so our whole trip wouldn't be a waste when someone whistled at us like we were dogs. Who's a dog? I should've bit him! It was George and he told us in plain English to "go away," which we did after a few mumbled choice words. I was so mad at him I bought a John and Yoko poster! I understand why George was so mad though. A few days earlier at Apple, he came on an annual yearly visit. On his way in some French boys decided they didn't want him to rush in, as George usually does. So one of the boys jumped on his shoulder. George was furious! He threw the guy off and in a Liverpool Teddy Boy voice said, "I wouldn't do that if I were you. I'll bash your face in!" I've seen George twice since then and both times he's been very nice and friendly. As for the other Beatles, my apologies to Paul for all those tourists who went trapesing up to Scotland invading his property. Can't you people relaize why he went there? Well, he's coming home now, I guess, so Heather can return to school. John's been in L.A. since I came here. 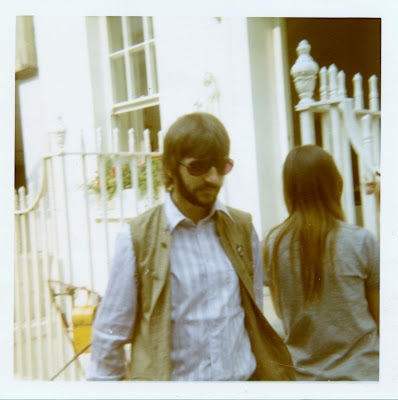 Ringo is all about London. I've seen him at Apple quite a few times. P.S. George is a better housekeeper than Paul! Also I saw a travel poster for Japan, It said, 'Yoko's been there! Have you?" Remember, the word "fan" is short for "fanatic". Sara, which of the Beatles do you think was most friendly with fans based on all the stories you've come across?